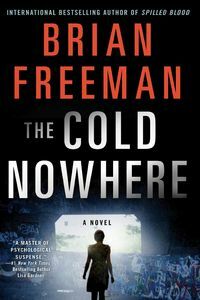 The Cold Nowhere by Brian Freeman, a Mysterious Review. Review: When teenager Cat Mateo shows up on the doorstep of Duluth detective Jonathan Stride, he takes her in despite reservations about the story she tells about being chased and nearly killed. Stride had investigated her parents' murder-suicide 10 years ago, a crime which Cat witnessed, but hasn't seen the young girl since then. Still, when he follows up on some of the details she tells him, he's convinced she's in danger, in The Cold Nowhere, the sixth mystery in this series by Brian Freeman. Cat hasn't been exactly living a clean life these past few years, and Stride's partner, Maggie Bei, isn't so sure that she's completely innocent, and quietly starts a separate investigation. When one of Cat's friends is murdered, presumably mistaken for her, Stride begins to think that a local celebrity, Leonard "Lowball Lenny" Keck, a popular, wealthy and influential car dealer, may be at the center of a prostitution ring, supplying underage girls to clients as a means to further his political ambitions. But the pieces simply don't fit together. It isn't until Stride realizes that the answers he's seeking are to be found in the past, that he begins to understand what's going on all around him. The Cold Nowhere starts strong, and ends even stronger, but is weighed down by a middle 150 pages or so where little of substance (or interest) happens. Yet another example of a thriller that seems to prioritize some arbitrary page count over its plot. Still, the storyline is interesting and nicely constructed, intricately detailed but not overly confusing despite its multiple plot threads. The whodunit element is particularly well-handled. It is, to be sure, uneven in places, especially when both Cat and Stride, separately and respectively, revisit their troubled pasts, relating (as memories) what happened or they think actually happened, which helps somewhat to define their characters but occurs a little too frequently, goes on a little too long, and in the end really doesn't matter much to the story. For the most part, a solidly written and entertaining thriller, but one that could have benefited from being more tautly edited. Acknowledgment: Random House provided an ARC of The Cold Nowhere for this review.